Christmas seems to go from zero to sixty in a nanosecond. And there’s a reason for that. We complain about seeing Christmas paraphernalia in November and then, seemingly within minutes, we’re running around with our hair on fire. The problem is that ‘Christmas movies’give us the impression that there is something magical about Christmas. Nothing costs anything. Everyone looks fabulous and slender dashing about through fake snow in a perfect red wool coat and eyelashes. Even the hairdos are bouncy. Suddenly love is in the air, children are always smiling in amazement and men with perfect teeth are dashing about being helpful and appreciative. Every commercial gives the impression that all this is within reach with that simple purchase of their Christmas magic product. Call now and get a second one free! Small monthly payments. And we buy into it. Year after year. Like those ubiquitous Christmas sheep. Even though we know there is no magic. That sea of December time is actually only a few precious days of weekend. We still have to go to work, after all. Life still happens. The house needs cleaning. Laundry needs doing. Kids need feeding. All the daily stuff of life continues to come at us like snow in high beams. Throw Christmas magic prep on top of that and it’s no wonder that Christmas magic turns into Christmas dread in a racy heartbeat. Oh sure, in the movies, children are eager to help, spouses are jolly, presents magically appear bought and wrapped under glorious trees that everyone is eager to decorate. We put it on ourselves, you know. Somehow, if everything isn’t perfect, we feel we have failed Christmas. Let’s get real. The kids don’t want to help. Your husband doesn’t want to go to any of those parties and will somehow feel better if he’s made that clear to you. You’re on your own here. The good news is that you are the one who sets the parameters. Slow the roll! Select some Christmas decorations from the stash in the basement. You really don’t have to put it all out and decorate every nook and cranny. No one will care. Trust me. Shop online, early and/or in bulk. Gift cards are good. Pay extra for store gift wrapping. Gift bags are fine. LCBO. Forget about baking cookies. That’s a vestige of the days when women didn’t work outside the home and people needed extra calories for whatever reason. And if needs must, we can buy them in stores these days. No one will notice. Well, maybe your mother-in-law, but she’ll get over it. Never mind the quest for a turkey the size of a Smart car. If you need that much meat, cook two normal sized birds. Cook one a day or two before, carve up, clean up and refrigerate. Simmer up the bones and bits if you want to feel cheffy, to make broth for gravy. On the day, roast the show bird, reheat the pre-carved one in some of that broth or gravy to ensure moistness, and you’ll look like a Christmas magician. While you’re at it, make the dressing well ahead and freeze it to heat up on the big day. Buy cranberry sauce. Let people to bring pies if they offer, and they will. You won’t get a purple heart if you soldier on all alone. 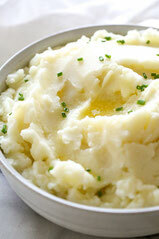 Use your Instant Pot for mashed potatoes. So fluffy and creamy. Vegetables? There’s a reason why domestic goddesses of yore made vegetable casseroles. They’re delicious and you can make them ahead. Lower your self-inflicted expectations. Cool your jets! Mashed Potatoes made in the Instant Pot! They are so creamy, so fluffy, and SO GOOD. From start to finish in 30 minutes, all in one pot! Do this early in the day so you have time to tidy up. Keep warm, or reheat. 7 russet potatoes (about 2 1/2 pounds) Gotta be Russet type potatoes. Starchy. Cook the potatoes: Peel the potatoes. Quarter them. Place in the Instant Pot and cover with water (about 4 cups). Add a teaspoon of salt. Cook on the steam setting for 12 minutes. Release steam right away. Check to be sure they’re cooked through. If not add a few more minutes. Drain. While your potatoes are cooking, melt the butter and olive oil in a skillet. Add the smashed garlic cloves and sprigs of rosemary, thyme, etc. and let them hang out over low heat for a while. When everything is bubbly and smells really good, and the potatoes are done, pull the garlic and herbs out and discard. You are left with garlic-herb-infused butter! Transfer the potatoes to a baking dish, place small cubes on butter on top, and place in a hot oven to melt the butter before serving. Sprinkle with chives and be proud of your fancy self. Russet potatoes are key for getting the right texture! I like these with Yukon Gold potatoes as well. They are a little sweeter but also more dense. The upshot? You’ll be less exhausted, irritable and resentful. You will actually have jolly good fun. And consequently, so will everyone else. Which might just be a little bit of Christmas magic right there!